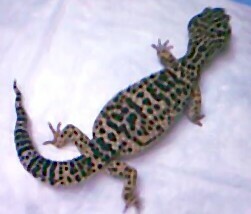 With a male leopard gecko, there is a V-shaped row of noticeable femoral pores (scent attraction) just above the vent before the tail begins between the back legs. Below the vent is a buldge, where hemipenes (reproductive organ) are located. The vent itself is just behind the back legs, before the tail begins, from whence they use the restroom or lay eggs. With the female, femoral pores are there but barely noticeable and there is relatively no buldge. Geckos begin to breed one to two years into adulthood, between Feb - August give or take a month at the beginning or end. They lay about two eggs for a clutch in intervals. Or rather, they may lay more than one clutch in a year depending on experience and age. Younger may lay one egg frequently while the more experienced may lay their clutches up to 8 times in a year, decreasing again as they draw closer to old age. While Fancy Dance lives with his females year round, they still managed to breed for their first time given closer feedings such as less powdered crickets, but on a nearly daily basis to every other day with mealworms between days, and more often mistings with the spray bottle like early in the morning to suppose a dew fall. Something like three times in a week rather than just misting when someone is molting. You can also introduce the male to the females you want him to breed with in season for at least a week or until you notice gravid females. Ensure the male is also at least a year old. Separating him for a while if he lives with them year round, and reintroducing him, may also stimulate him to breed. When a female becomes pregnant it's rather obvious. She lays around sleeping allot, stops eating, and becomes fat while her tail begins to thin. As the eggs develop they become very noticeable when you, preferably, for less stress on the female, turn her around in your hand to look at the belly, rather than attempt to hold her upside down. You may see the shape of the eggs. 79 degrees incubation of the eggs will tend to produce females while 85 degrees will produce a near equal ammount, with 90 producing more males, 92 degrees almost guaranteeing all males. Humidity should be kept up and constant and is rather a trial by error. Not so moist it's wet and not too dry. Somewhere around 80%. Freshly laid eggs are slightly sticky. If the egg is fertile, it will firm up, becoming rapidly turgid, and will feel slightly chalky to the touch. Infertile eggs are thin and soft. It should be picked up as it was laid, rather, don't turn the egg as you place it in incubation. My first year with my geckos laying eggs was not successful. By the time I had noticed eggs that were laid in the poop area it was too late to salvage them. I noticed another by a hide only by an hour or so and it was already rock hard. I found a final one in the substrate box but it was too wet and fell apart. I think there was a kind of 50/50 here between us. This was their first time, Susie Q, JJ, and Missy and they might lay them in such places over the substrate box. But, I think I could have made the substrate box more appealing as well. I think it was too wet. My final pregnant female, Missy, became egg bound. Females may retain their eggs looking for a suitable place to lay them if they don't like their arrangement. The tank itself should be misted to raise the humidity and the substrate box have enough moisture and warmth. I tried switching her around. I made a tank that was completely substrated but that didn't seem to really help. I changed the substrate in her original tank and put her back with the others but still nothing. It's frustrating and I'm sure it's my fault one way or another that she didn't feel comfortable enough about her tank to lay the eggs, or something was wrong with her to begin with. Maybe the eggs were too big. Moving her was most possibly the big mistake but it had already seemed to me like she was taking a while. More often times than not the situation is fatal but Leo's can survive being egg bound and should be taken to the vet as soon as possible. Missy didn't make it. It's not easy to take, maybe they aren't fuzzy and cuddly, but they are very easy to get attached to.